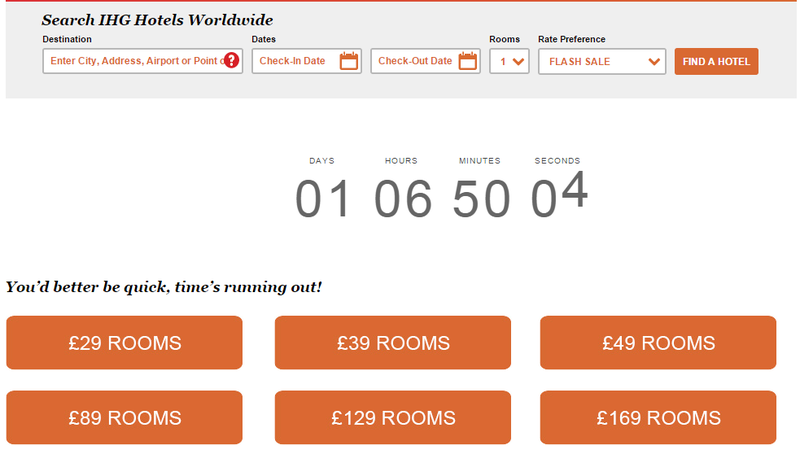 I just found out that IHG is running a 48 hour sale where you can get rooms in Europe for as low as £29 (~$33.38). That’s crazy cheap! If you have a trip planned to Europe soon, this would be a great way to sleep affordably. Must book by 7pm EST on 1/17/15. Must stay between 1/24/15 and 2/14/15. You can try going to this link, but if that doesn’t work follow these steps. Go to ihg.com and login. Change your location to United Kingdom. Click on “Last chance: 48hr Sale now on! Rooms from £29”. Look through the participating hotels look up the dates. Find a date and book your hotel. Eligibility: The Winter Sale Promotion (“Offer”) is only open to all IHG® Rewards Club members and Ambassador Club members (“Members” separately each a “Member”). Participation constitutes a Member’s full and unconditional agreement to these Terms and Conditions and Promoter’s decisions, which are final and binding in all matters related to the Offer. Benefiting from the Offer is contingent upon fulfilling all requirements set forth herein and is subject to availability. Timing: Bookings for the Offer opens at 00:01 GMT on Friday 16 January 2015 for all IHG®Rewards Club Members. The Offer closes for all members at 23.59 on Saturday 17 January 2015 (“Promotional Period”). How to enter: To be eligible to make use of the Offer the guest must become a Member during the Promotional Period, and book either via www.ihg.com, the Central Reservation Office, or the IHG Mobile App. This Promotion is in no way sponsored, endorsed or administered by, or associated with, Facebook, Twitter or Foursquare. Facebook, Twitter and Foursquare may not be held liable for any claim arising from a Member’s participation in the Offer. Members agree to allow the Promoter to collect personal details in order to facilitate the Offer and may, for this purpose, disclose such information to third parties, including but not limited to agents, contractors, and service providers. The Promoter reserves the right to cancel, suspend and/or modify the Offer, or any part of it, and/or review and amend these Terms and Conditions at any time on prior notice. Members shall be deemed to have agreed to any such amendments unless they advise otherwise. Promoter reserves the right in its sole discretion to disqualify any individual it finds to be tampering with the entry process or the operation of the Offer or to be acting in violation of these Terms and Conditions. Proof of submitting entries will not be deemed proof of receipt by Promoter. Disputes: The Offer and these Terms and Conditions are governed by the law of England and Wales and any disputes arising under these Terms and Conditions will be subject to the exclusive jurisdiction of the courts of England and Wales. Promoter: The promoter is InterContinental Hotels Group Services Company, Broadwater Park, Denham, Buckinghamshire, UB9 5HR, United Kingdom.